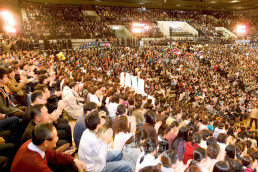 On December 9, 2004, it was warm for winter and the 5th New Life Concert started at the Olympic Gymnasium #3 from 7 p.m. hosted by the New Life Welfare Foundation. The concert was to help children with heart disease and intractable disease and parentless households, so that they would live their future life more beautiful, overcoming their diseases and difficult situations. 4,000 members from the foundation attended and it was sponsored by Seoul Metropolitan City, Korean Committee for UNICEF, Save the Children and Forbes Korea. At the donation delivery ceremony, 14 children with heart disease and intractable diseases received medical expenses. A total of 24 children received donations through the 5th concert including 10 parentless households and children suffering from intractable disease and extreme poverty, who didn’t attend because they lived in provinces. When the chairwoman comforted beneficiary families one by one, delivering a donation and a gift, members applauded, wishing them health and happiness. After that, the awards ceremony was held for the “Writing Contest to Share Love” held on November 21 as a part of the “Blood Drive.” Among 472 writings, six pieces of verse and prose, which described the family love and neighborly love well, were selected. Each awardee received an prize along with a gift certificate and a bouquet of flowers. After the donation delivery ceremony and the awards ceremony finished, the concert started with the New Life Children Choir’s children’s song medley. Each of the Children Choir members wore a traditional costume of each country and pleased all the audiences. As the foundation members Park Ok-hui and Cho Min-hyeon sang a song, “Magnolia Blossom” in soft and gentle voices, the audiences waved luminous sticks and cell phones and the concert hall was beautifully embroidered with twinkling lights. The foundation members Kim So-ra and Kim Dong-wook sang a newly composed Pansori (a traditional Korean narrative song), “The Lamp of Love,” in mellow voices to the accompaniments of various Korean traditional instruments such as gayageum, geomungo, haegeum, ajaeng, buk and so on; they described the activities of the foundation members, who try to convey their love with the heart of a mother who feels bitter pain for her sick child. The musical, “The Rabbit and the Tortoise,” which was performed by the New Life Children Choir, let the beneficiary children forget about their hard lives and laugh in a long time. 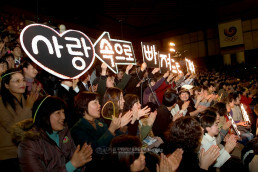 Lastly, when the foundation members Kim Jae-hun and Bae Gyeong-seop sang songs about love, the audience sang together, inscribing the meaning of the lyrics, “We will stretch out our hands and light up the dark place with our love.” The 5th New Life Concert, which was full of love and light let down a curtain, leaving gentle waves of love in the heart of 4,000 members who attended the event. 7-year-old Min-ju, who came to see the concert on crutches because she suffered from juvenile rheumatoid arthritis, wanted to be a doctor to cure the sick. Her mother, Yeom Geum-suk, said that she felt guilty whenever she heard her daughter screaming when she bent her daughter’s leg to prevent it from becoming rigid. She said, “The concert relieved my pain,” and added that she would live with hope because many people helped her. .
Mun Yeong-ae, who had been worrying about the medical expenses for her baby, Jong-hun, suffering from heart disease, was also moved to tears and smiled brightly. Park Gyeong-suk and Kim Gyeong-ae working for the Seoul municipal social welfare facility, “Boys’ House,” were also very delighted because two children whom they were taking care of had opportunities to receive operations: Yu-ri who had already removed her one eye because of eye cancer and had to be operated on the other eye urgently, and Su-jeong who was suffering from heart disease. The members’ 36.5-degree-love brought comfort and happiness to everyone.